In our research we investigate the sensory nervous system with a specific focus on systems level mechanisms of brain organization and neural plasticity. 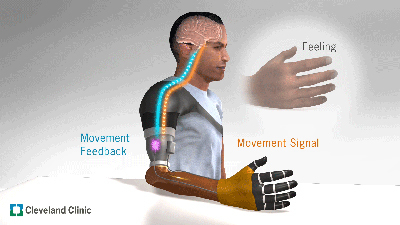 A major interest of the laboratory is sensory integration with prosthetic devices. With our research we investigate a variety of ways to “close-the-loop” and to provide physiologically relevant touch and proprioceptive feedback for artificial limbs. We accomplish this by using different model systems and a variety of translational approaches from electrophysiological cortical mapping to psychophysical and cognitive studies to provide insight into how sensory feedback can be returned from a prosthesis to an amputee through physiologically appropriate neural channels. Our work focuses on establishing a mechanistic understanding of how sensory channels organize and integrate to establish a cognitive sense of self, embodiment and awareness of limb movement. With these approaches we then work to interact and utilize these sensory/cognitive pathways to drive cognitive engagement with artificial limbs for amputees. 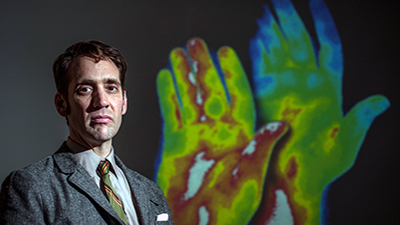 Dr Marasco and his team work to understand the sensory nervous system and develop translational approaches for providing natural touch and movement feedback for artificial limbs. Fox JD, Capadona JR, Marasco PD, Rowan SJ. (2013) Bioinspired Water-Enhanced Mechanical Gradient Nanocomposite Films That Mimic the Architecture and Properties of the Squid Beak. J Am Chem Soc. Marasco PD, and Kuiken TA. (2010) Amputation with median nerve redirection (Targeted Reinnervation) reactivates forepaw barrel subfield in rats. Journal of Neuroscience 30:16008-16014. Marasco PD, Schultz AE, Kuiken TA. (2009) Sensory capacity of reinnervated skin after redirection of amputated upper limb nerves to the chest. Brain. 132(pt 6): 1441-8. Schultz AE, Marasco PD, Kuiken TA. (2009) Vibrotactile detection thresholds for chest skin of amputees following targeted reinnervation surgery. Brain Research. 1251:121-9. Marasco PD, Tsuruda PR, Bautista DM, Catania KC. (2007) The fine structure of Eimer’s organ in the coast mole (Scapanus orarius). Anatomical Record. 290: 437-448. A team of scientists led by Cleveland Clinic has published first-of-its-kind findings in Science Translational Medicine on a new method of restoring natural movement sensation in patients with prosthetic arms. Paul Marasco, PhD, Biomedical Engineering, is among an elite group to receive the highest prize awarded by the U.S. Government for investigators in the early stage of their independent scientific careers: The Presidential Early Career Award for Scientists and Engineers (PECASE). Dr. Marasco, who also holds an appointment at the Louis Stokes Cleveland VA Medical Center, is one of just three awardees under the entire VA medical system, with its more than 150 sites nationwide.